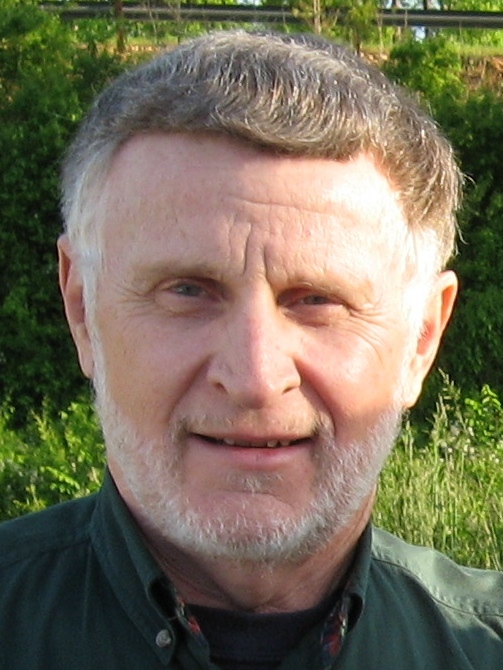 This site reviews my history and work, including: family background, my education, work experience, and my creative life-- as expressed in poetry, plays, and critical essays. To contact me, click on the email icon at the upper right of this page. To see my listing in Poets & Writers, click here. East Texas Book Fest, Tyler Junior College, Tyler TX, September 13, 2014. I was one of 50 authors offering my poetry books for sale during this one-day event, 10 am - 3 pm. Meet the Authors Open House, Daily Sentinel offices, Nacogdoches TX, April 26, 2016. I was one of 14 authors presenting my poetry books for sale at this event, part of the Nacogdoches Tricentennial celebration. ﻿Reading of my poem "Eyes" at the reception for Susan Hacker Stang's fine-art photography book reAppearances at Sheldon Art Galleries in St. Louis MO, March 29, 2016. Susan invited me to include the poem as the frontispiece for her book, and to read it at the gallery event. A snapshot from the video of my reading is shown below, and the complete video can be viewed on my Author Page at Amazon.com. ArtWalk, Longview TX, July 7, 2016. This is an event sponsored by a consortium of art-related groups in downtown Longview, and is held several times a year. The event always includes various artists, musicians, craft demonstrations, etc., set up around downtown, and draws visitors from around the region. This July, Judy and I took selected titles of our books to sell (mine were: First Kingdoms, Grand Canyon Days, and Vermeer in Words -- for descriptions of these, see my Poetry Books page here), and Judy also offered a set of 8x10 prints and 5x7 greeting cards of her photographs from FineArtAmerica.com. We were assigned space in the beautiful Citizens National Bank in downtown Longview, where the staff made us feel welcome by providing a handsome area for setting up our tables, a small snack buffet, and precious air conditioning which helped mollify the mid-summer Texas heat. We shared the high-ceilinged bank lobby with two other artists, both painters; during the 3-hr event, at least 50 visitors came through the bank, and perhaps half that many stopped at our tables. Book reading and slideshow: "Rembrandt and Vermeer: Two Dutch painters as seen by two Nacogdoches poets." This reading was sponsored by the College of Fine Arts, Stephen F. Austin State University. It was a joint reading with my wife Judith Lauter, based on our two books about these painters: her Light from the Left; poems on paintings by Rembrandt (﻿LightFromTheLeft.com﻿), and my Vermeer in Words, both Xlibris, 2013. (For more about my book on Vermeer, scroll down on the ﻿poetry-book page﻿ here. ) A photo of Judy reading her poems is on the Recent Events subpage at her website JudithLauter.com; and a movie clip of me reading one of the Vermeer poems will soon be added to my author page at Amazon. Eloise Adams, original director of the Stephen F. Austin Art Galleries, recommended we do this event; and John Handley, the current director of SFA galleries, agreed to host the reading, with a book signing to follow, at 2 pm, Sunday November 13, 2016, at the jewel of the SFA galleries, the beautiful Cole Art Center at 329 E. Main Street in Nacogdoches TX. Michael Tubbs, Gallery Preparator for the SFA School of Art, assisted with logistics; Cayla Mendow, an SFA Fine Arts student, designed the flyer (see leftmost image, below); and Trey Cartwright, Senior Media Producer for SFA Marketing Communications, recorded the presentation -- our thanks for all their support, and to our enthusiastic audience. Poem displayed in "Pollinators of the World" Art Exhibit; inaugural showing in Nacogdoches TX, to be followed by an art-press book (LaNana Creek Press) and a trade color book (SFA Press). This gallery show, presented in conjunction with the Pollinators PowWow held in Nacogdoches in spring 2017, was curated by Charles D. Jones, director of the LaNana Creek Press, SFA School of Art, and David Kulhavy, Lacy H. Hunt Professor of Landscape Ecology and Entomology in the Division of Environmental Sciences of SFA's Arthur Temple College of Forestry and Agriculture. The invitation to participate was distributed internationally, and artworks were submitted from artists from around the world, including Costa Rica, Brazil, S. Korea, Russia, Africa, Malaysia, the U.S., and Mexico. Pieces selected by the curators were exhibited in the Upstairs Gallery at the Cole Art Center, Nacogdoches TX; May 4 (opening reception) – May 20, 2017. Judy submitted four digital drawings along with haiku, and I wrote a poem "Bees Dancing," which was printed and framed beside another of her digital drawings, of bees on a coneflower (in the photograph below showing our set of entries, my poem with the drawing is in the frame just over my left shoulder). Book reading and slideshow: "Rembrandt and Vermeer: Two Dutch painters as seen by two Texas poets." 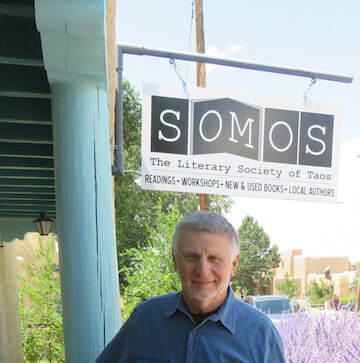 This reading was sponsored by SOMOS, the Society of the Muse of the Southwest, in August 2017 in Taos NM. Like the one listed just above, given in Nacogdoches, this was a joint reading with my wife Judith Lauter, based on our two books about these painters: her Light from the Left; poems on paintings by Rembrandt (﻿LightFromTheLeft.com﻿), and my Vermeer in Words, both Xlibris, 2013. (For more about my book on Vermeer, scroll down on the ﻿poetry-book page﻿ here. ) Jan Smith, SOMOS Director, suggested we hold the reading in their classroom fitted with a 70-inch smart TV, which was perfect for presenting our slideshow of these beautiful paintings. Our thanks to Jan for her interest and enthusiasm, which helped make it a rewarding afternoon. Book reading and slideshow: "Just Back from the Mountains: Two Nacogdoches poets visit northern New Mexico and southern Colorado." 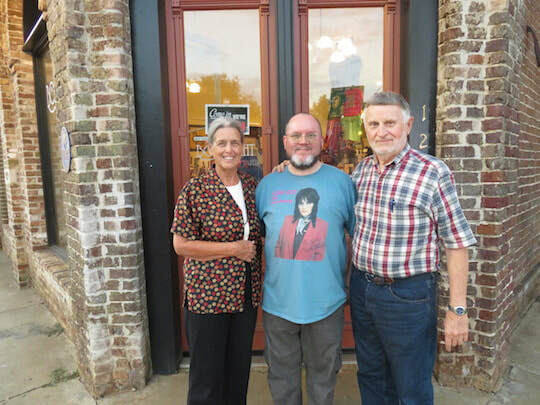 This reading, hosted in October 2017 by Tim Bryant's amazing Bosslight bookstore at 123 E. Main in downtown Nacogdoches, was another joint reading with Judy. For this one, we alternated reading selections from our two books celebrating late summer and early fall in some of our favorite places in and around the southern Rockies. I read from New Mexico Notebook: Late Summer in the Mountains (for more about my book, scroll down on the ﻿poetry-book page﻿ here); and Judy read from her Rockies Autumn Haiku. A local rental service provided the big-screen TV for our slideshow of Judy's photos matched to the poems, and the enthusiastic audience made it a wonderful evening. Poetry reading: poem "Poema para mi esposa" (in Spanish), for the Evening of International Poetry event sponsored by the Stephen F. Austin State University Department of Languages, Cultures, and Communication, Nov. 8, 2017. This was the 3rd year for this event, which is open to the public and attracts submissions from SFA students, faculty, and members of the community. I read my poem "Poema para mi esposa" ('Poem for my wife'), and Judy read her "Esperando" ('Waiting'). This year the event was held at SFA's Cole Art Center located at 329 E. Main in historic downtown Nacogdoches. The organizers selected nineteen poems to be read, representing Spanish, Portuguese, French, German, Polish, Vietnamese, and Rumanian. Eight of the speakers read their own poems, while eleven read from other authors; several presenters were accompanied (or accompanied themselves) with live music related to the poem. The very enthusiastic audience numbered about 70, and the organizers invited Judy and me to return next year. Poetry reading: poem “Primavera Amarilla” ('Yellow Spring,' in Spanish, by Juan Ramon Jimenez), for the Evening of International Poetry event sponsored by the Stephen F. Austin State University Department of Languages, Cultures, and Communication, Nov. 13, 2018. This was the 4th year for this event, described more fully in the entry just above for 2017. This year the organizers selected twenty-six poems, representing 12 languages: Spanish, Portuguese, French, German, Polish, Japanese, Afrikaans, Latin, Classical Greek, Romanian, Polish, and Russian. Eleven of the speakers read their own poems, while fifteen read from other authors. The audience numbered about 80, and the organizers invited Judy and me to return yet again next year.